Despite feverish speculation from doomsayers, the near-Earth asteroid 2012 DA14 won't slam into our planet next year, NASA researchers say. The asteroid, which astronomers estimate to be about 150 feet (45 meters) across, will give Earth an uncomfortably close shave on Feb. 15, 2013, coming nearer to our planet than the satellites we've lofted to geostationary orbit. But 2012 DA14 poses no real impact danger on that pass, according to NASA scientists. "Its orbit about the sun can bring it no closer to the Earth's surface than 3.2 Earth radii on February 15, 2013," researchers with the Near-Earth Object Program Office, at NASA's Jet Propulsion Laboratory in Pasadena, Calif., wrote in an update today (March 6). One Earth radius is roughly 3,963 miles (6,378 kilometers) at the equator. So by this reckoning, the nearest 2012 DA14 can get to us next year is 12,680 miles (20,406 km). For comparison, satellites in geosynchronous orbit circle our planet at an altitude of 22,245 miles (35,800 km). Other satellites orbit much lower. The International Space Station, for example, flies at around 240 miles (386 km) above the planet. 2012 DA14 was discovered late last month by astronomers at the La Sagra Observatory in southern Spain. Its path around the sun is roughly similar to that of Earth, and it makes relatively close approaches to our planet twice per orbit. Calculations show that the space rock came within about 1.5 million miles (2.5 million km) this past Feb. 16, or about six times the distance from Earth to the moon. Next February's much closer encounter has ignited something of a media firestorm, with various outlets publishing stories with headlines such as "Incoming! 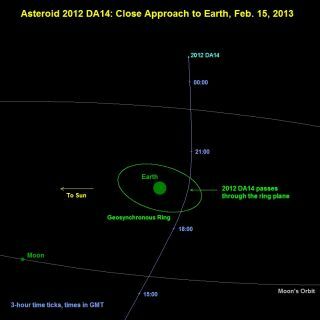 Asteroid 2012 DA14" and "Tunguska-Sized Asteroid Homing on Earth." This latter article is referring to the 1908 "Tunguska event," in which a comet or meteoroid exploded above the Podkamennaya Tunguska River in Siberia, flattening about 500,000 acres (2,000 square km) of forest. While 2012 DA14 won't slam into us next February, humanity needs to remain vigilant against the asteroid threat, many researchers say. Huge impacts are a part of our planet's history, after all; one wiped out the dinosaurs 65 million years ago, and it's just a matter of time before another big space rock lines Earth up in its sights, astronomers say.